Well, it’s that time of year again. 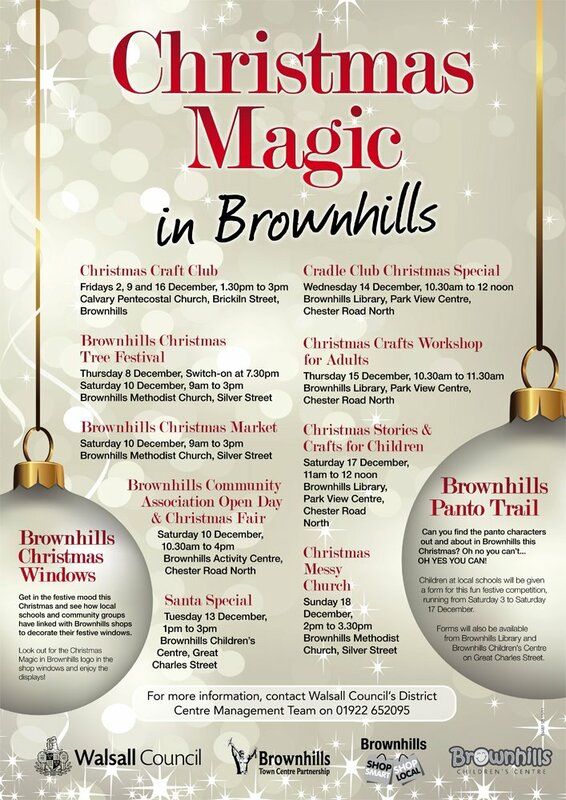 I noticed today that posters were up for this year’s Brownhills Christmas Magic events, and thought I’d better get hold of a copy and run it on the blog. I always like to support these functions, but sadly, I’m rarely sent the details. Thankfully, I found the flyer concerned on the Facebook site of the Brownhills Town Centre Partnership, and I’ll obviously promote each individual event as they crop up. I know a whole lot of effort goes into each event, so please do support them. Brownhills has a great sense of community and it’s wonderful to see folk out in the town having a good time. Meanwhile, if you’re organising anything at all, please do drop me a line. I do like to promote local stuff wherever possible. It’s an easy way to reach 4,000 readers a week, absolutely free of charge. Mail your details to BrownhillsBob at Googlemail dot com. Cheers. This entry was posted in Brownhills stuff, Churches, Clayhanger stuff, Environment, Events, Followups, Fun stuff to see and do, It makes me mad!, Just plain daft, Local media, Local politics, News, Reader enquiries and tagged Brownhills, Brownhills Christmas Evens, Brownhills Christmas Windows, Christmas Fair, Christmas Magic in Brownhills, Christmas tree festival, Cradle Club, Craft Club, Festivity, Messy Church, Panto trail, Santa Special, Shop Local, Shop smart, Silly, Walsall, Walsall Council, Walsall Wood. Bookmark the permalink. 5 Responses to 2011 Christmas magic events in Brownhills! Can you tell me if the market has moved location, it was behind the tesco in brown hills, i drove there today and its gone? but where? Thank you. Sorry, Claire, the market ceased for good earlier this yer. Brownhills market is no more. How very sad. I loved going there for the shoe man! where has he done! Thanks Bob.